Excitement prevailed as we finally left Utah behind and started our climb into the 47th state of our adventure. 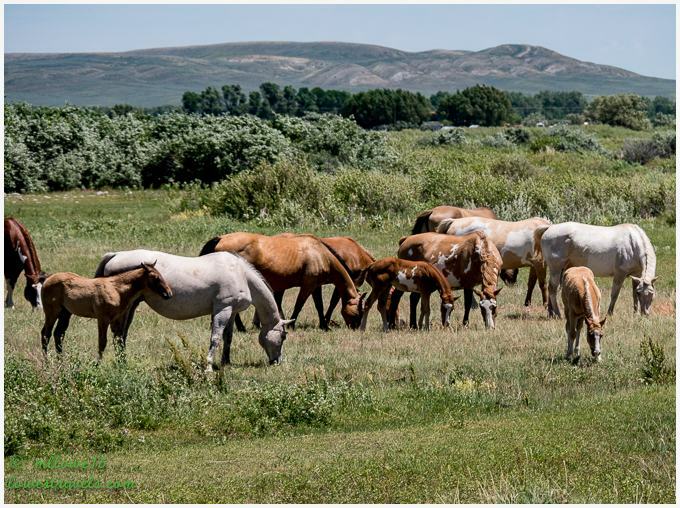 As Steve navigated the long climb followed by a steep downgrade to our new home base at Lander, we immediately recognized what this state is known for – wide open spaces, cattle, wild horses and cowboys. 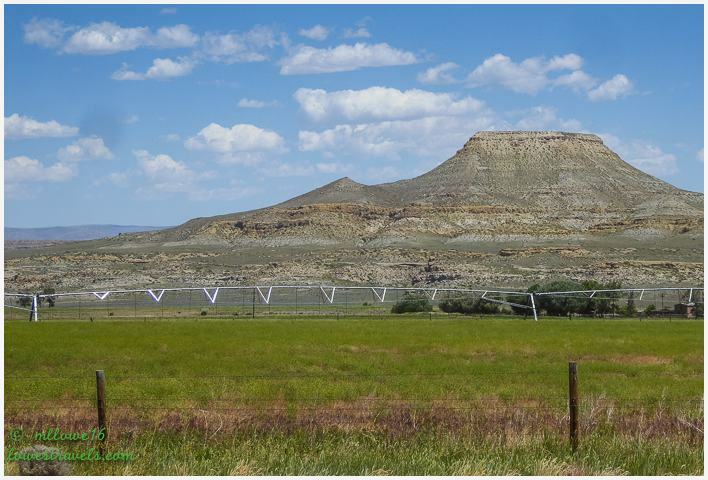 It also has the lowest population density of any state in the lower 48. 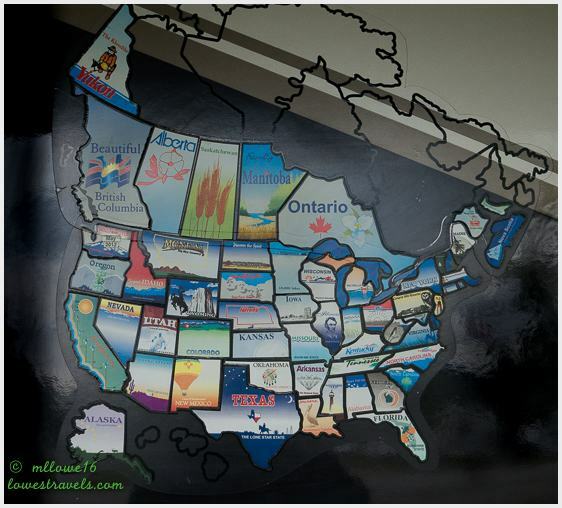 No state income tax and low sales taxes, plus reasonable prices for homes with property – hmm, better take a closer look! Lander is the county seat for Fremont County, which covers a total area of 9,266 square miles – roughly the size of Vermont. Only 12% is privately owned land, with the remainder being government held in the form of BLM, US Forest Service and State Parks. 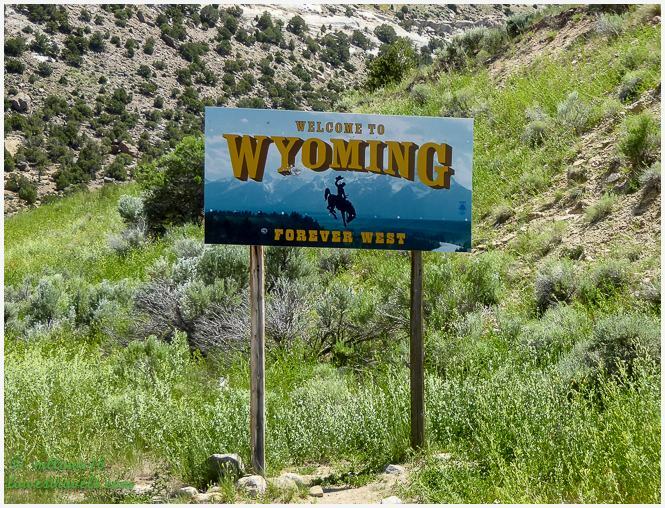 And how about this: 48% of the land in Wyoming is held by the U.S. Government, with the state responsible for another 6%. 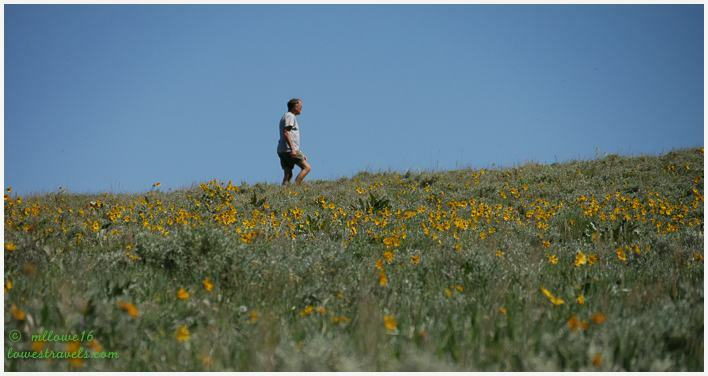 To me personally its a good thing – more protected spaces to explore and enjoy! 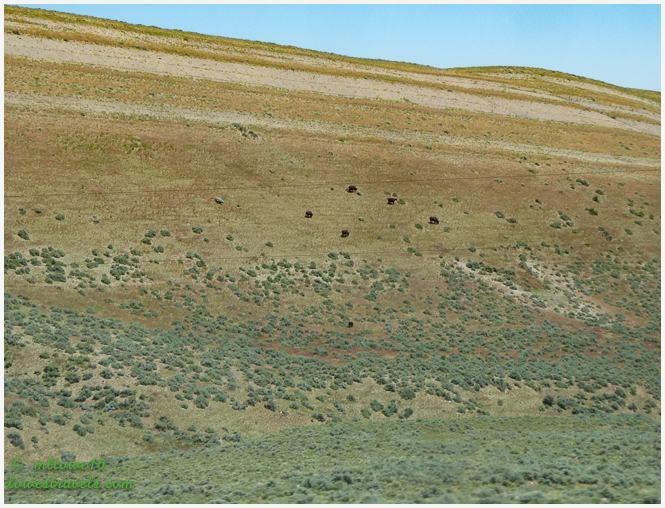 Cows on the hillside, can you spot them? 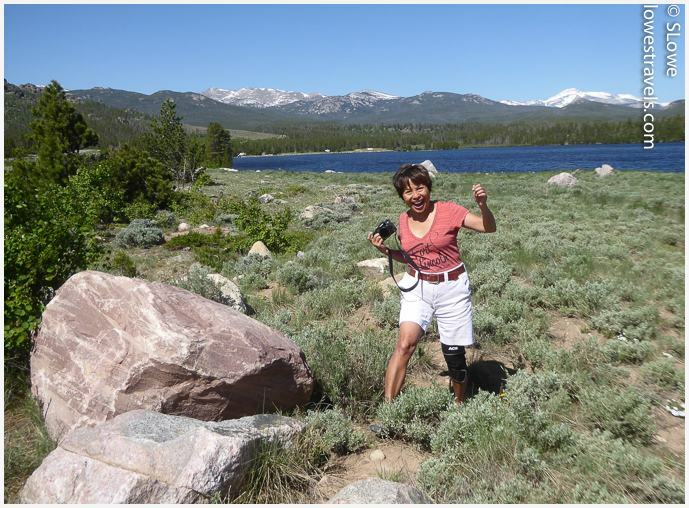 During our one-week stay, heat and wind played a role in our outdoor activities. And while my knee is getting better every day, it will be a while before I get back to the long hikes I’m missing so much. 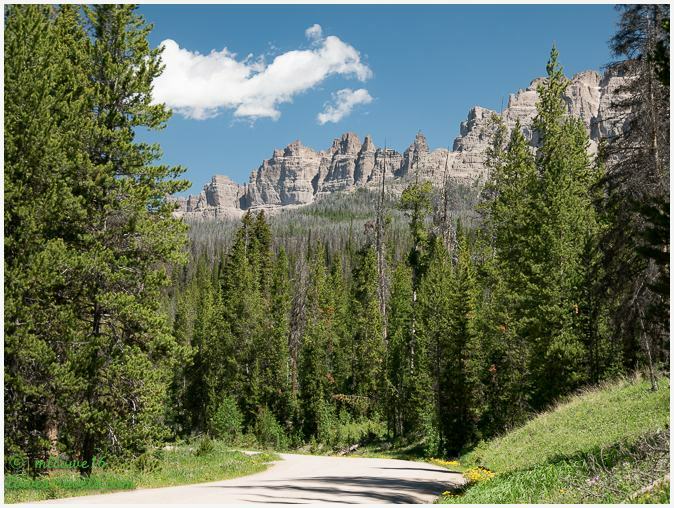 Our “must-see’s” near Lander included Sinks Canyon State Park, Louis Lake Road, Red Canyon, Shoshone National Forest, Sacajawea’s gravesite and Centennial Scenic Byway. 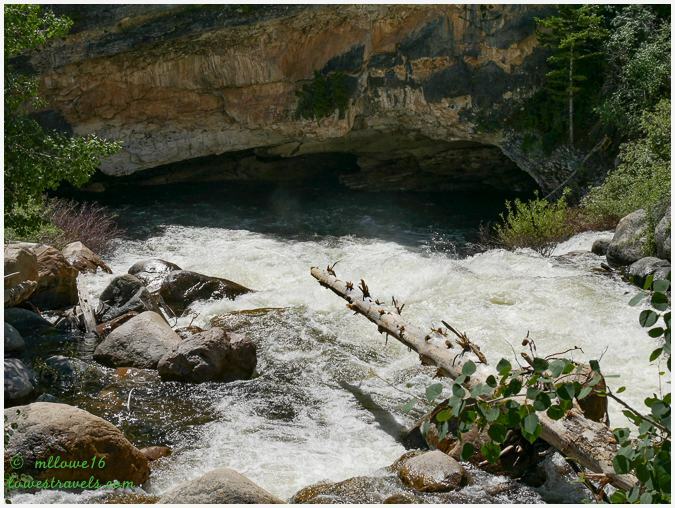 Sinks Canyon is so named because of the “disappearing” Popo Agie River that flows through it from the Wind River Mountains. Midway down the canyon, the river rushes into a large cave, sinking into the fissures and cracks at the back of the cavern and disappearing. It then emerges 1/4 mile down the canyon at “the Rise” after its 2-hour underground excursion. Very cool! Spelunkers are unable to explore very far into the Sinks, hence no one knows the exact path the water travels while underground. 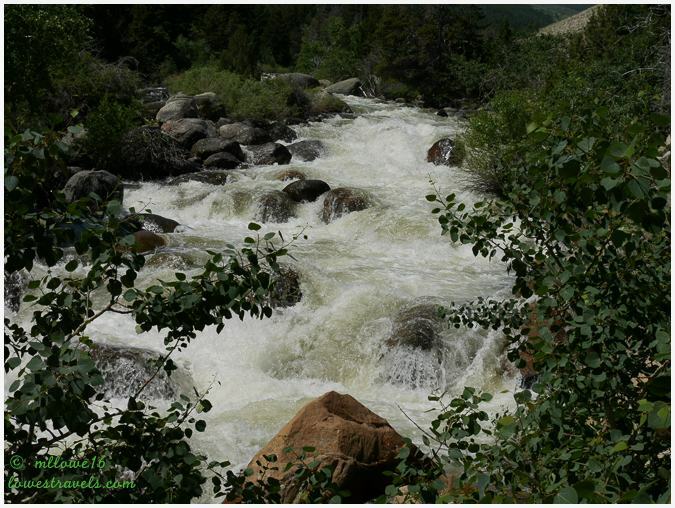 Geologists speculate that it circulates through many narrow, winding passages until it resurfaces. Dye tests proved the connection between the Sink and Rise. 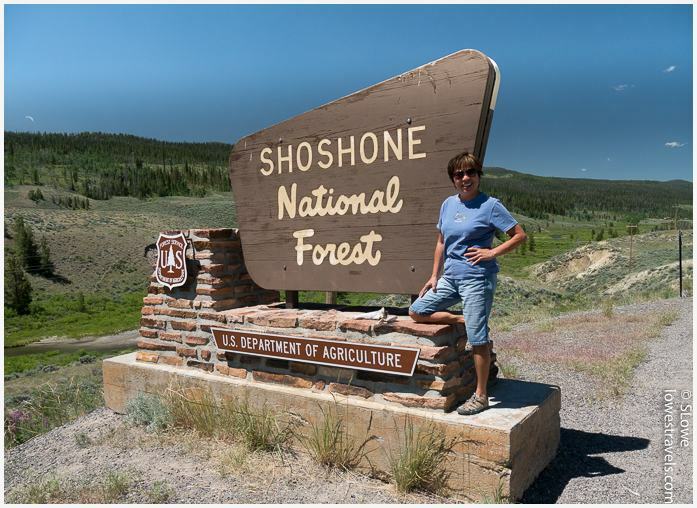 Just eight miles from Sinks Canyon State Park we crossed into Shoshone National Forest, the first national forest in the U.S. Driving Louis Lake Road, we traveled through the forest and climbed up several tight switchbacks. 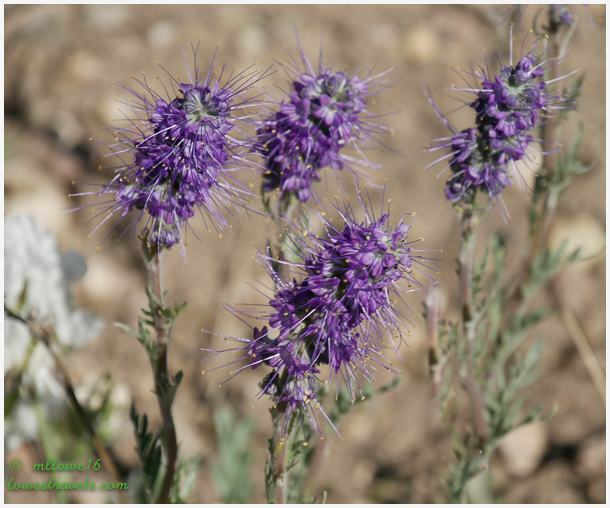 Our reward after cresting the ridge was scenic vistas and mountain meadows carpeted with yellow and purple flowers. 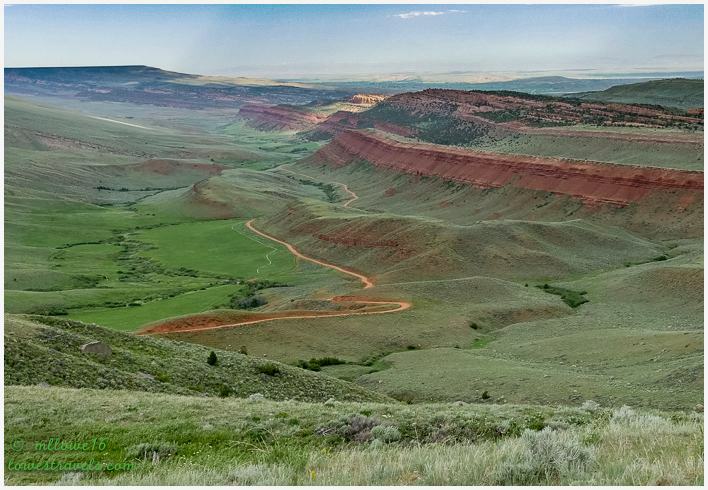 Red Canyon is a large exposure of Chugwater Sandstone that lies 18 miles south of Lander. 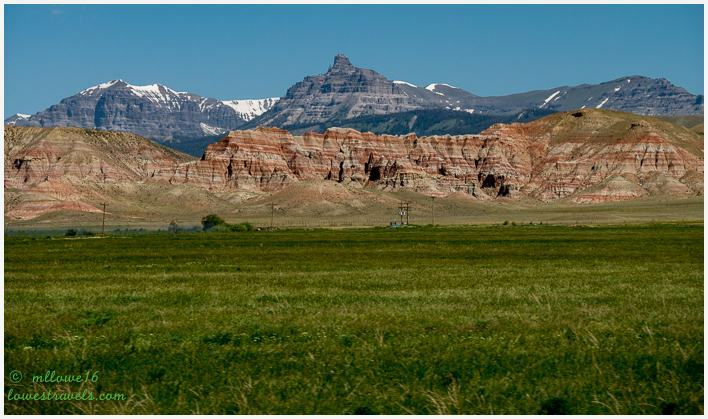 The red color of the spectacular cliffs comes from oxidized iron that was formed 60 million years ago during the uplift of the Wind River Range to the west. 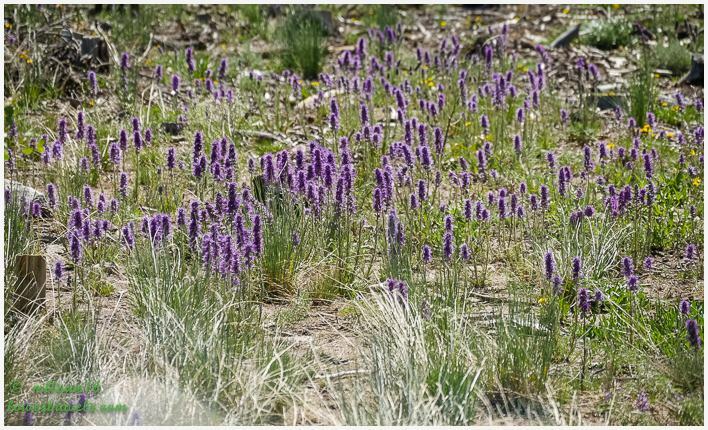 Currently designated as Red Canyon Wildlife Habitat Management Area, this landmark provides important wildlife habitat for elk, muledeer and a host of other small mammals. 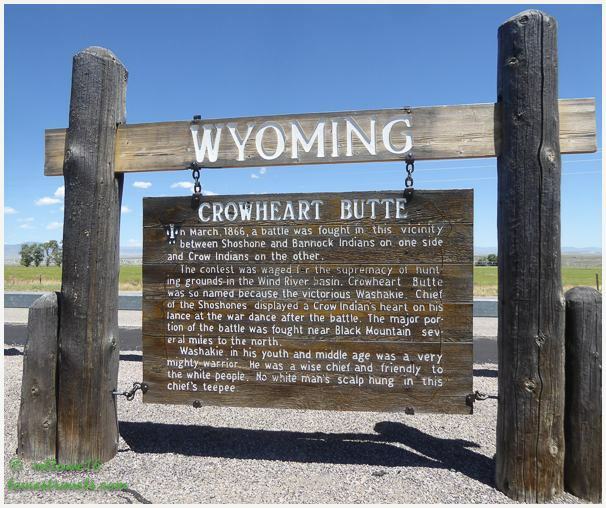 Another auto hike took us to Wyoming Centennial Scenic Byway on highway 26/287. 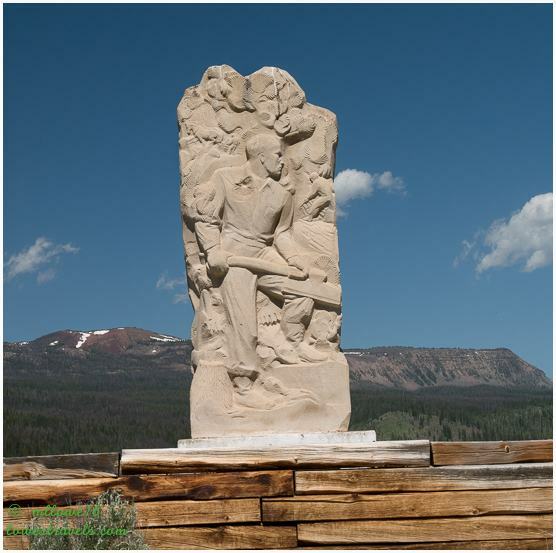 It goes all the way to the Grand Tetons, but we drove only 90 miles before turning around at the Tie Hack Memorial. It was a good stop, for we learned something – do you know what a tie hack is? Tie hacks were lumberjacks who cut and shaped trees into railroad ties – by hand – for the transcontinental railroad in the early 20th century. 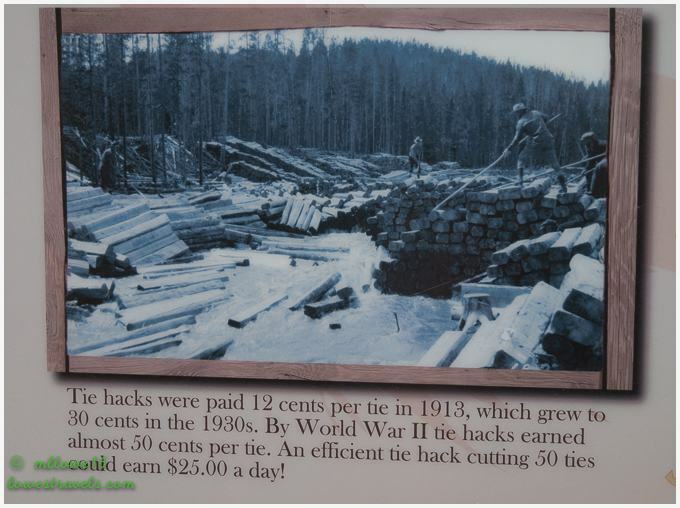 Tie hacks were replaced long ago by gas powered sawmills, sawyers, cutters and skidders. 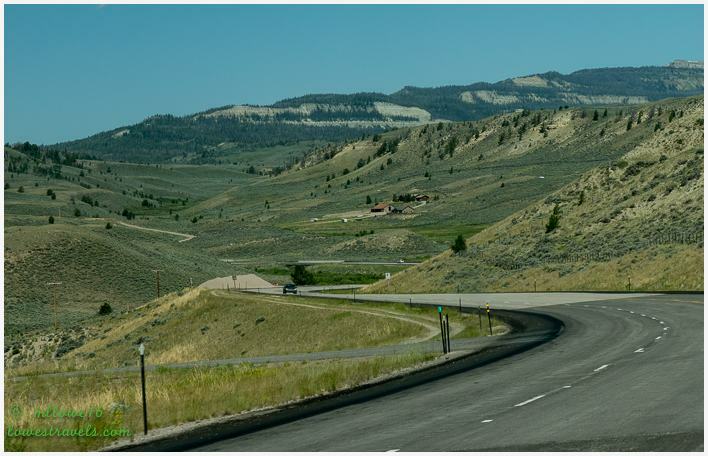 The drive from Dubios, WY where the byway begins up to where we terminated our auto hike winds through broad valleys, pine forests and mountain scenery as it cuts through Shoshone National Forest. Folks like us who enjoy the history of the Lewis and Clark Expedition will remember Sacajawea. She was the Shoshone woman who assisted Lewis and Clark’s expedition to the Pacific Ocean. An active cemetery, the Sacajawea Cemetery in the Wind River Indian Reservation at Fort Washakie is named for her. Her official gravesite is located there, and we were happy to find it after searching through another cemetery on the other side of town and thinking we’d missed it. 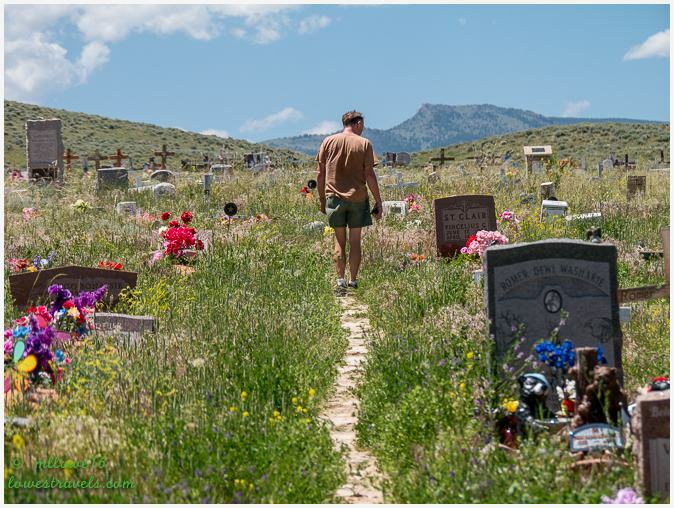 In search of the Sacajea gravesite. The cemeteries here are very colorful! Between sightseeing tours, Steve completed some “Betsy tasks”, including replacing the engine CCV filter (his post here). He also did some more mundane chores including yet another “Betsy Bath” to remove the relentless dust from recent winds. He rewarded himself (and me) with a nice batch of buffalo wings as he continues his quest for the perfect wing. More buffalo wings – yay! While Steve worked I ran off to snap more images of my feathered friends at our feeder. Although not new birds for me, they always put a smile on my face. 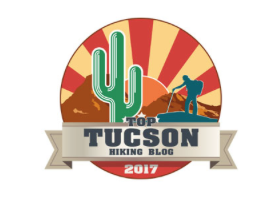 When we stopped at Lander (Steve’s campground review here) we didn’t know there would be so many interesting things to do and so many hiking opportunities – even though I’m not up to that yet. 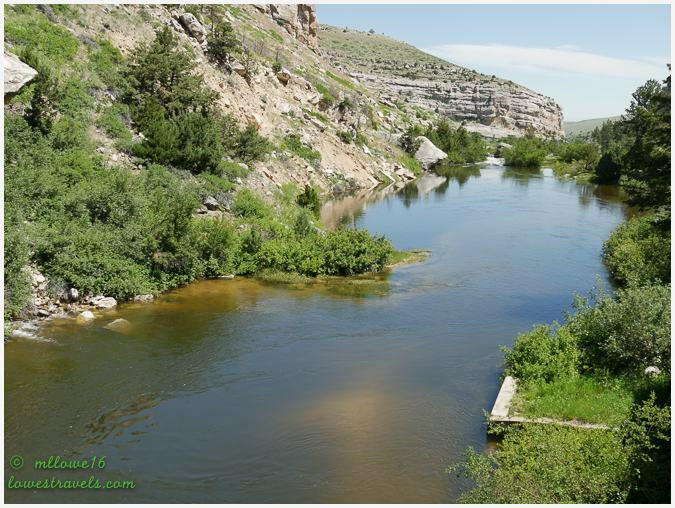 It was a great place to get our first taste of Wyoming, and we’re ready to see more!